April | 2015 | Mike Lamberti, From Margate To Cleveland, And Back ! Sami Huetter generally has a smile on her face, and West Essex’s sophomore righty was grinning a little more after her team’s hard-fought 2-0 win over one of the state’s better teams, Lodi Immaculate, on April 30, in North Caldwell. Huetter struck out six and worked out of a few jams during the game with Lodi Immaculate. And her ERA (thanks to Bob Pezzuti for this stat) is 0.61 against the likes of Ridgewood, Mount St. Dominic and Lodi Immaculate. Monica Onorata drove in a run when West Essex scored the game’s only runs in the bottom of the first. Good defense by West Essex made the lead hold, especially a tremendous play by Madison Gemma in the top of the third. With one out, Lodi Immaculate had loaded the bases. Huetter got the next batter to pop up, but the wind carried the ball into short right field. Gemma, playing second, circled under the ball and made the catch. The runner on third tagged on the play and Gemma made a perfect throw to the plate, where catcher (A) Rose (By Any Other Name) Pezzuti applied the tag to end the inning. West Essex coach Andrea Mondadori Llauget was happy to see her team get back on track after losing a pair of games to Ridgewood and Mount St. Dominic, both by shutout. 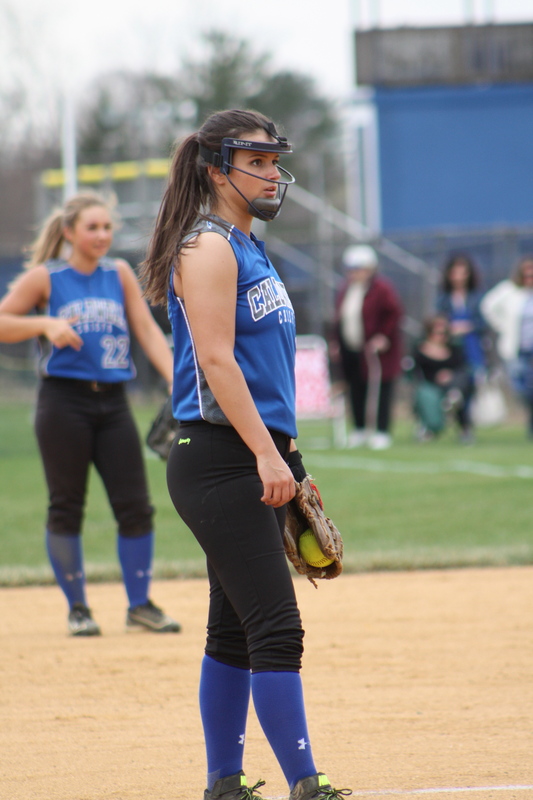 Bloomfield picked up a huge win on April 30, when it defeated a good Verona team, 6-5, in the first round of the Essex County Tournament, in Bloomfield. The Bengals (4-10) will most likely face top-seeded Mount St. Dominic in the quarterfinals on, or about May 9. Bloomfield coach Bob Mayer was happy for his team. Verona, which was seeded ninth in the ECT, fell to 9-4. The Hillbillies will have a huge game in the Super Essex Conference’s (SEC) Liberty Division on May 1, when it visits Caldwell at 4 p.m.
Bloomfield and West Essex will meet in an SEC American Division matchup on May 1, in Bloomfield. There’s never been a question when it comes to Marina Lombardi’s ability as a catcher for the Livingston High School softball team. ‘Silver Charm’ has been behind the plate now for four years, putting together an but incredibly consistent softball career. Perhaps it was her head coach, Jason Daily, who summed up Lombardi’s attributes best. “She’s not only a tremendous player, but as nice a person as you’ll ever meet,” Daily said of the senior who will attend Montclair State this fall. Marina Lombardi (center), here with her mother, Elena, and dad, Chuck, is working hard on a fundraiser to help a friend in need. And that gentle spirit, which defines a compassionate young woman, is shining even more, as Marina attempts to help a friend, who is battling an illness. Sara Gelbert, a vibrant young woman, battling a rare illness. Sara was diagnosed with Chronic Intestinal Pseudo Obstruction (CIPO) and Gastroparesis. These conditions are so severe that she is considered to be in intestinal failure. She is fed overnight straight into her heart with Total Parenteral Nutriton (IV nutrition). She has to drain her stomach 24/7 because her body is unable to contain its own digestive contents. There are only about 150 cases diagnosed a year worldwide and there is no cure. Symptoms can be managed, but this usually requires very invasive surgeries and expensive medications that often are not covered by insurance. Sara lives every day with severe pain and constant nausea. She has good days and bad days. Sometimes she can behave like a normal 19 year old girl, and other times she is so sick she can’t even get out of bed. CIPO is a complex and rare disease that gets minimal funding and little awareness. Sara has set out to form ‘Sara’s Army’, a nonprofit organization created to raise awareness and funding for her own medical treatments as well as research towards a cure for this disease. Through the help of Lisa and Ally Royce, a video of Sara’s story at our first was shared at Livingston High’s first softball parent meeting last fall. After several emails back and forth, Sara informed Marina that she’s been in and out of the hospital but is now home and getting back on her feet. She was also thankful and appreciative for the Lancers support and hoped to come to one of Livingston’s games. Marina spoke to Coach Daily, and in an effort to raise awareness of the little-known disease, the Livingston softball team is selling baked goods, snacks, drinks and wristbands this Friday, May 1, when the Lancers play Montclair , with all proceeds going to Sara’s Army. It’s far too often that we hear of mistakes kids make while growing up. 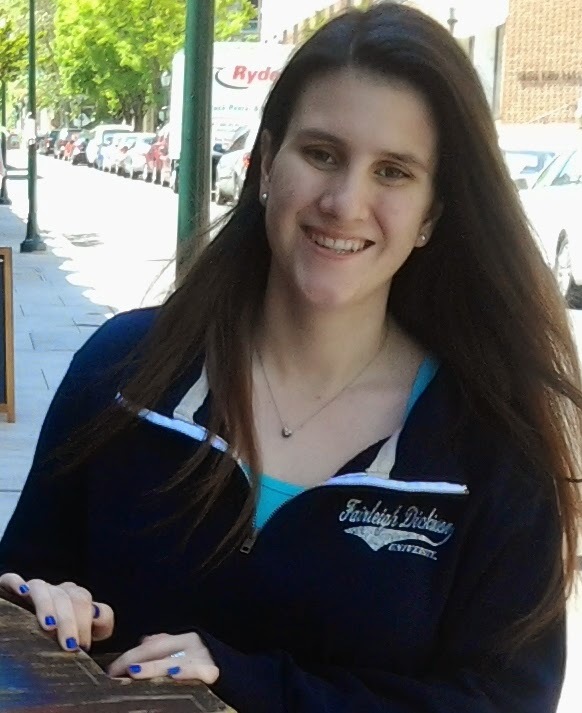 In this case, here’s a young athlete in Marina Lombardi who not only wants to help someone in need, but has gone the extra mile to put together what should be a very nice event on May 1. For more information about CIPO and Sara’s Army – visit her website: http://www.sarasarmy.com. And if time permits, please stop by Friday’s game at Livingston and support a very worthy cause. Livingston and Newark Academy played an interesting game on April 28, with the Lancers edging the Minutemen, 3-1. Couple of observations. The pitching, on both sides, was solid and Newark Academy has a very talented infield, with kids who can flat out make plays. For Livingston, Sami Passeri pitched 6 2/3 solid innings before giving way to Sydney (Syd the Kid) McCormack, who gave up a bases-loaded single before retiring Newark Academy’s talented third baseman, Sophie Rosenberg, (AKA, Arts and Letters) to finish the game. (Rosenberg, a junior, is the newest stud). On April 27, I saw Cedar Grove and Mount St. Dominic play a good game at MSD, with the top-ranked Lions winning, 2-0. Obviously, pitching dominated, as the Mount’s Kelsey Oh spun a two-hitter, while striking out nine and walking one. Cedar Grove freshman pitcher Kali McCabe allowed just four hits against a potent lineup. Cedar Grove will have an interesting draw in the upcoming Essex County Tournament. The Panthers could face Livingston in the quarterfinals, then MSD in the semis. As far as the Lions of Mount St. Dominic, we’ve all known how good they are since the season started. 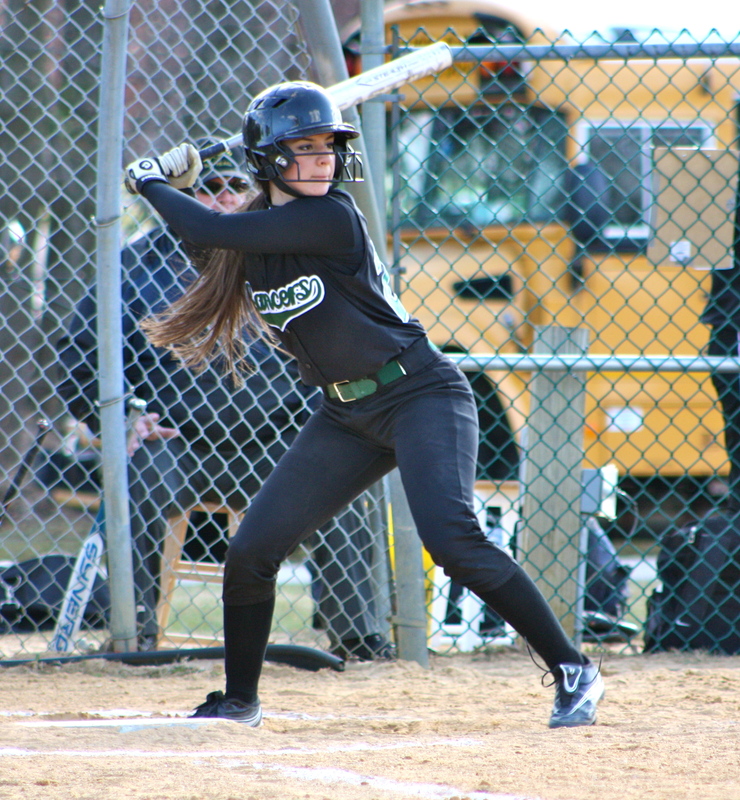 But even more was learned last Saturday when the Lions fell behind by three runs in the second game of the MSDA Lions Softball Invitational, against a strong Notre Dame team, before rallying back with five runs before Notre Dame could catch its collective breath in the field. (The Mount went on to win, 7-3). Mount St. Dominic is not only good, they’re very hungry. While this team won a state championship last year to cap a triple crown season (SEC, ECT and Non-Public A), this is a much different group in 2015, since graduation took its toll from a year ago. There’s only senior on the roster, in Alexandra Dabroski, a very talented second baseman who sparks this team at the top of the lineup. Oh continues to be nearly unstoppable in the circle. As a freshman last year, she showed the mettle to lead the team to a state championship. That savvy, along with a year’s experience, could make her even tougher in 2015. While we’re at it, let’s not forget about Nutley. The Raiders would make Al Davis proud. They pretty much, just win. They’re unbeaten on the road in league play and its only two setbacks within the SEC came in extra innings, at home. MSD and Nutley have yet to play this season, and that could be an interesting matchup. As a matter of fact, the teams could meet three times in a 16-day span, starting on April 30, in Caldwell, continuing six days later in Nutley, and a possible third meeting in the county championship game on May 16. 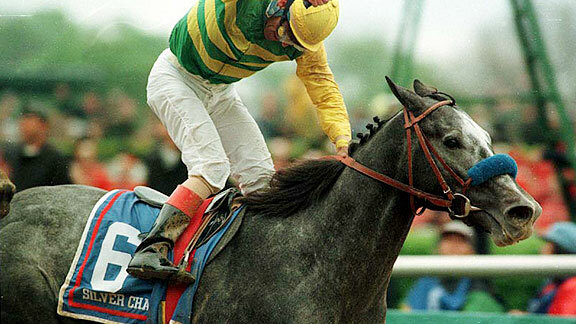 The Kentucky Derby is this Saturday, May 2, which is also the day of the first round of the ECT. Some interesting games await, including Newark Academy at Nutley, Montclair visiting Livingston, Verona at Bloomfield and Belleville traveling to Caldwell. The quarterfinals are set for May 9, at the home of the higher seed, followed by the semifinals and finals, at Ivy Hill Park, on May 15 and 16. Here is the updated Top 10. The Lions swept two games at its tournament last Saturday, then defeated a good Lodi Immaculate squad a day later in Saddle Brook. Three of its losses have been by 1-0 counts. The other three losses were by one run each to Morristown and Cedar Grove, with its ‘worst’ loss by two runs to Morris Knolls. Sami Huetter (Canonero II) continues to do a good job in the circle. 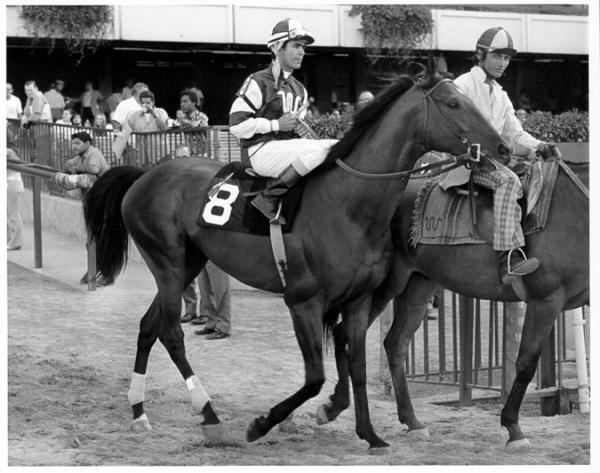 As long as Spectacular Bid (Carly Anderson) is pitching, Nutley will be dangerous. And as long as Anderson is batting at the top of the lineup, a potent offense will be tough to contain. Another team which is tough to beat. The Panthers continue to improve and were impressive in a 2-0 loss to Mount St. Dominic last Monday. Erin Stacevicz (California Chrome) dazzles at shortstop and is good as they get in the leadoff role. Lancers are very young, and while they might not be among the favorites to win the county title this year, they’re still talented enough to be serious contenders. Chiefs were riding a three-game winning streak entering a game with West Orange on April 29. 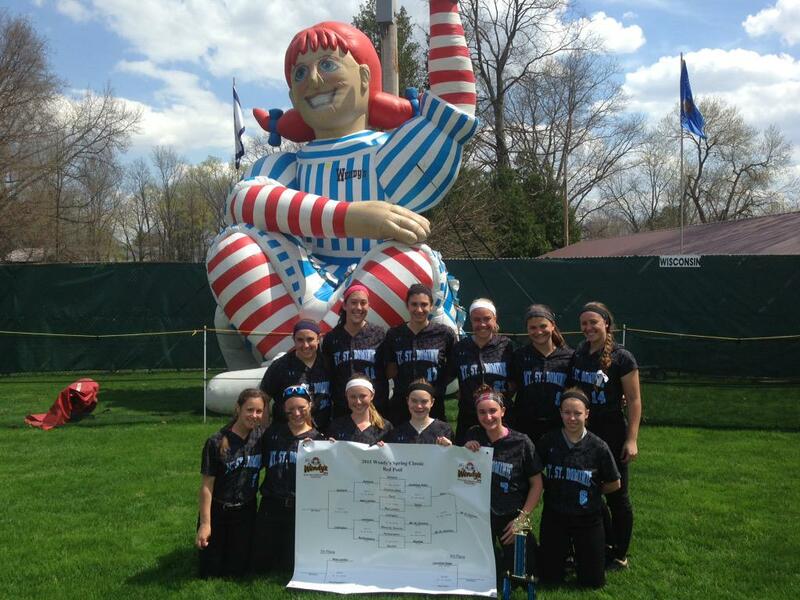 The team had a huge win over Paramus Catholic at the MSDA Lions Softball Invitational last weekend. Hillbillies having one of its best seasons in years and will be a tough test in the ECT. Millers will hear about its schedule, but it did gain a respectable 10th seed in the ECT and will face Columbia in the first round on Saturday night, in South Orange. A win there moves it into the quarters against West Essex. Will host Millburn on Saturday in first round, ECT game. Head coach Sergio Rodriguez feels this team is very close to breaking through. He may be right. Watch for Arts and Letters, Sophie Rosenberg, who has a good glove and potent bat. The annual Mount St. Dominic Invitational was held on April 25, with near perfect weather and plenty of good softball at the Mount’s home complex in Caldwell. First and foremost, the tournament was well run, as usual. MSD head coach Lorenzo Sozio puts a lot of time and effort into the event, which attracts some solid teams throughout New Jersey, as well as Delaware and Pennsylvania. Four Essex County schools participated, including, of course, the host team, which was 2-0, with two exciting games, including a scintillating come-from-behind victory in the second game against a very good Notre Dame team. Livingston, which has been playing in the tourney since 2012, was 1-1, losing to Arthur L. Johnson, but then rebounding with an 11-6 victory over Red Lion Christian Academy, of Delaware. The Lancers had actually fallen behind by a 5-1 count early in the second game before head coach Jason Daily made an unusual move, basically changing his entire lineup, midstream, in favor of younger, less experienced players who clearly wanted to make an impression with valuable playing time. Livingston (8-4) took control behind the pitching of Sydney ‘Syd The Kid’ McCormack and some aggressive bats. While this was a young Lancers team, a lot of coaches who were watching the game, were really impressed by the young talent in green and white. Caldwell’s 5-4 victory over Paramus Catholic was a big confidence builder for the Chiefs, who had lost a 16-2 contest to West Essex a day earlier. Senior pitcher Cayla Lombardi pitched a complete game for the win. Lombardi bore down in the final three innings to keep the Paladins off the scoreboard. She also made a key tag at home plate, after a runner from third attempted to score the tying run, on a wild pitch. Caldwell catcher Christina Guarino chased after the errant toss and threw to Lombardi, who made the tag on a close play at the plate. (You’ll be hearing more about Guarino, a sophomore, who is a really good catcher). And what can you say about the defense of senior shortstop Gianna Genello (AKA Smarty Jones)? The Rowan-bound spark plug is the catalyst at the top of the lineup, and also made two sparkling defensive plays, including one which stopped a PC rally in the third inning and kept Caldwell in the lead. Jessica Mattheiss drove in three runs for the Chiefs, including a big triple in the first when Caldwell (11-3) opened a 4-0 lead. Newark Academy dropped a 10-7 contest to Raritan in the final game of the tourney, but N.A. coach Sergio Rodriguez likes what he’s seeing from a young Minuteman team. As for Mount St. Dominic, the Lions improved to 16-1 by defeating Pequannock, 6-4, and Notre Dame, 7-3. MSD actually trailed, 3-0, to Notre Dame, but came back quickly, with five runs, then put it away with a pair of runs in the seventh. When adversity was a possibility, the Lions rebounded like champions. The team won a state title last year, but did lose six key players to graduation. Despite that, they’re on quite a run so far this season, and have to be favorites to repeat, even if the coaching staff sticks to the ‘we’re just trying to get better’ line. Kelsey Oh was the winning pitcher in both games, as the sophomore righty continues to dominate with an overpowering fast ball. For three straight weekends, the Lions have impressed, winning at Rancocas Valley, the Wendy’s Classic in Ohio and now at their own tourney. It was great seeing Montclair coach Phil Delgado at the tourney. While Delgado’s team wasn’t playing at MSD on Saturday, it’s rare when you won’t see him near a softball game. The guy loves the sport and has quickly established himself as an up-and-coming coach in Essex County. Really nice man, too. Sozio’s one-time high school football coach, Chet Parlavecchio, was on hand, too, and quite proud to see Lorenzo’s Lions playing very well. Sozio played football for Parlavecchio at Bloomfield High in 1987 and 1988. In 1988, Sozio quarterbacked the Bengals to a 7-0 win over Paramus Catholic, which broke a long Bloomfield losing skid. 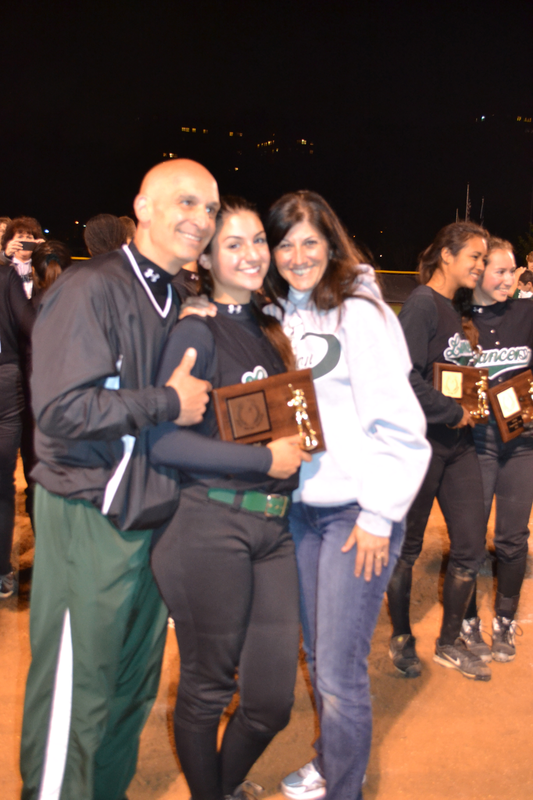 After three years of coaching in the NFL with the Tennessee Titans, Parlavecchio was recently named head football coach at Passaic Valley High and his daughter, Nicole, is doing some softball coaching at Johnson Regional, which was playing in the MSD tourney. Chet Parlavecchio, Jr., is currently an assistant football coach at Delbarton. And speaking of Delbarton, that school’s highly successful wrestling coach, Bryan Stoll, was on hand to watch some of the tourney on Saturday. One of the real nice men in Essex County made an appearance. 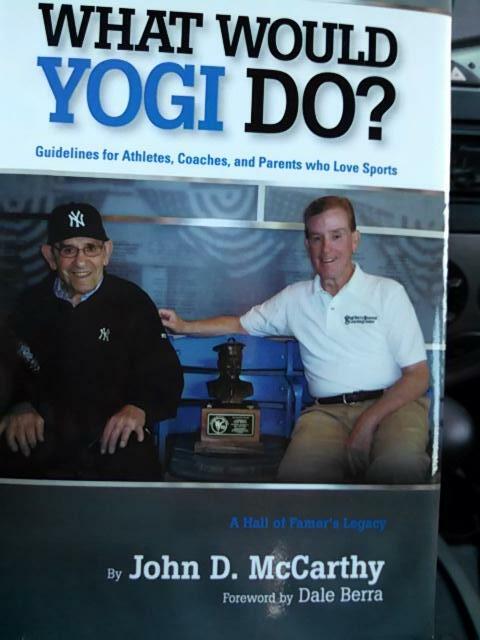 John McCarthy recently wrote a book entitled ‘What Would Yogi Do‘, and I can’t wait to read it. (Much more on that coming soon). Later, when Ed thought about wearing some Notre Dame regalia, he was worried Sozio might have him thrown out of the ball park. When Ed was last seen, he was wondering who would drive him back to his Montclair home following the tourney. I’m sure he got back safe and sound. During the Caldwell game, Cayla Lombardi’s dad, Carl, was telling me some great stories of his childhood. Carl Lombardi’s dad was once a minor league teammate of Mickey Mantle. That probably explains while Cayla wears No. 7 on her Caldwell jersey. All in all, it was a fun day of softball at the Mount. Even Caldwell University softball coach Dean Johnson was there to keep us all entertained. Livingston’s Marina Lombardi may appear somewhat stoic and laid back while having a conversation, but the senior catcher is far from that when she’s competing for her high school softball team. The Big Green Machine’s ‘Silver Charm’ has had quite the athletic career at Livingston High School, including being a part of two Essex County championship teams, as well as a pair of Super Essex Conference championships and back-to-back NJSIAA sectional titles. Livingston coach Jason Daily can’t believe how quickly four years have passed, since the unassuming Lombardi first took over as Livingston’s catcher in the magical 2012 season, when the Lancers finished 29-1. Lombardi’s prowess behind the plate has been known for a few years now. Not many teams will attempt to run on her, as her arm is not only accurate, but a lot stronger than people realize. 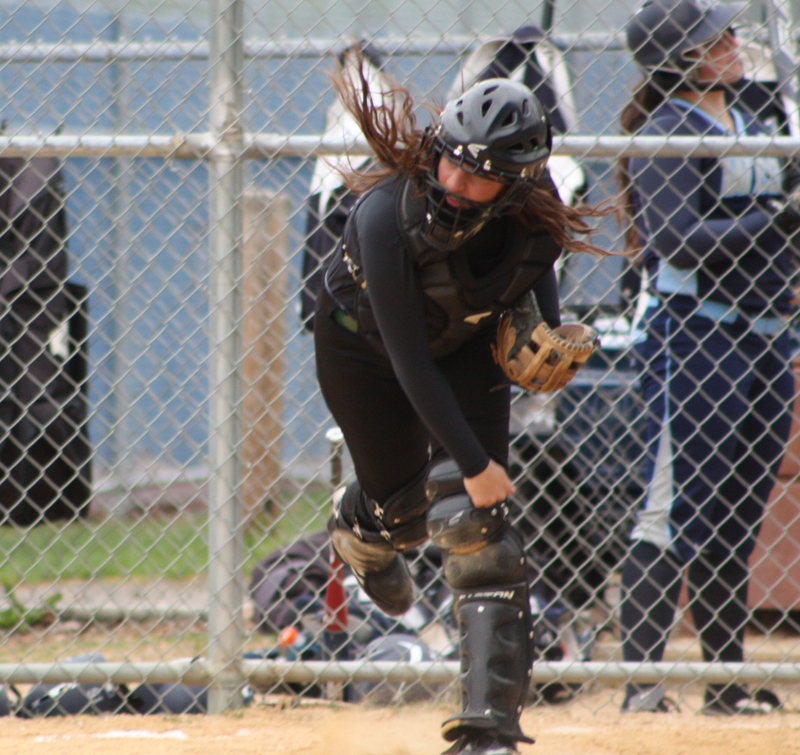 Perhaps Lombardi’s biggest asset is calling her own game behind the plate, a rarity in New Jersey high school softball. During Daily’s 15-year tenure as head coach at Livingston, Lombardi is just the second catcher to start for four consecutive years. When she emerged as the starter in 2012, she was catching Secretariat, Jess Peslak, who was then a junior. Peslak had a tremendous season that year, finishing 26-1, with over 300 strikeouts, as the Lancers won the SEC, ECT and state sectional title. After two years with Peslak and enjoying incredible success, Lombardi and Passeri were batterymates last year, and this season. Lombardi has also worked with junior pitcher Syd (The Kid) McCormack. At the plate, Lombardi, the daughter of Chuck and Elena Lombardi, and granddaughter of the incomparable ‘Poppop’ Bob Lombardi (who is a regular at Marina’s games), is clearly one of Livingston’s best offensive threats. In a recent game against West Essex, she was walked three times. Her power to the opposite field continues to improve. Marina is having a big year at the plate, too, for the 2015 Lancers. Marina hopes to play on the collegiate level this fall, and is expected to attend Montclair State University. A funny story about Marina. Two summers ago, I was having dinner with Jean and Ed Peslak, along with Jess Peslak and Marina at a favorite spot in Belleville. When dinner was over the check came, Marina reached into her purse to pay her share. It’s that kind of respect Marina has long held for adults and friends. A Silver Charm, and then some. 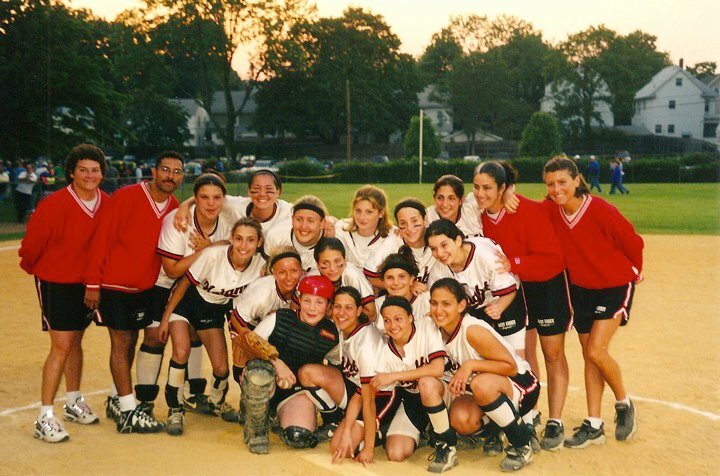 The 38th Essex County Softball Tournament will commence on April 23, with play-in games. The ECT has become a very exciting tournament over the years. Let’s take a look at some frequently asked questions by fans of the tourney, as well as the 25 things you need to know about the tourney’s storied history. Generally, a committee of Essex County coaches will vote on the seeds. That meeting was held on Tuesday, April 21, with coaches from the various divisions of the Super Essex Conference (SEC). All of the coaches are welcomed to comment on where they think their team should be seeded, but in the end, the committee makes the final choices. And. for the first time since the SEC’s formation in 2010, the Colonial Division saw two teams, Millburn and Belleville, gain solid seeds, with Millburn 10th and Belleville, 11th. For sure, the committee did a great job. The top eight seeds are solid, with Mount St. Dominic, West Essex, Nutley, Cedar Grove, Livingston, Caldwell, Columbia and Bloomfield. (I had it slightly different, with Verona, seventh, Columbia eighth and Bloomfield, ninth, but I’m no expert, either). The defending champs are the overwhelming favorite, but there’s no way coach Lorenzo Sozio will allow the Lions to take this tourney lightly. Mount St. Dominic’s excellence in the ECT speaks for itself. The Lions have five county titles to its credit, and has won all of its championships since Sozio was named coach in 1996. The Mount has been to 12 finals, including the past four, and seven of the last eight. If it advances to this year’s final, it will pass Belleville for most appearances in a county championship game and if it wins the crown, MSD will stand second, all time, in tourney history with six championships. Currently, the Lions and Livingston have five county titles each. 5-Will there be another Newark Academy-type run in 2015? And don’t forget last year’s solid run by Caldwell, which advanced to the ECT semifinals. The Chiefs stunned arch rival West Essex in the quarters and gave the eventual champions, Mount St. Dominic, a good run in the semifinals. Caldwell didn’t need to play in, but it was still an impressive performance. 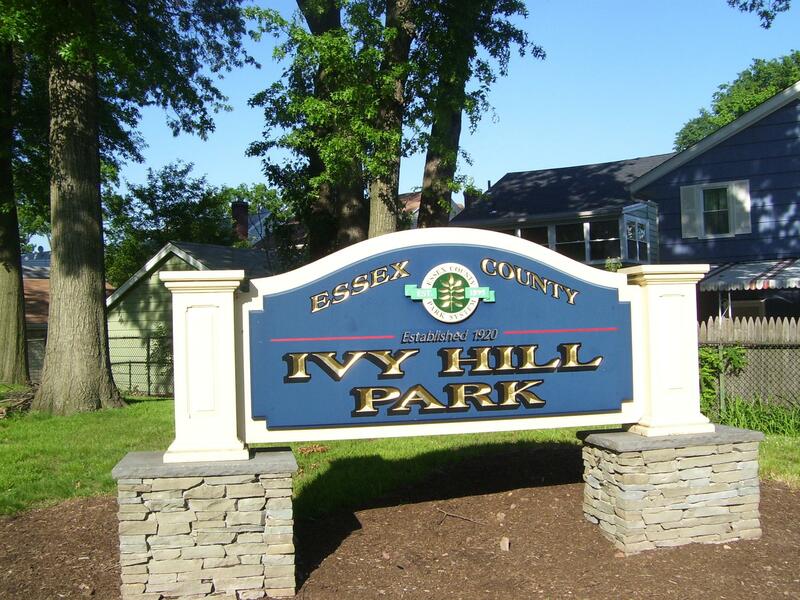 Essex County’s Ivy Hill Park will host the ECT semifinals and finals on May 15 and 16. The semis are set for Friday, May 15 while the finals are the following night. Unfortunately, Seton Hall University’s field at Essex County’s Ivy Hill Park will be the site for the semis and finals. Having grown up and loving Ivy Hill Park, I’ll be honest. The sitelines at that field aren’t good, from a fan perspective. But it is what it is, I guess. I wish they’d play it at Pulaski Park again, but that’s me. Should the favorites win, the semifinals at Ivy Hill will feature Mount St. Dominic against Cedar Grove (or Livingston) while West Essex would play Nutley. Those are two really compelling games. It’s a fun tournament, with some conversation and debate, but in the end, it’s for the kids to enjoy. Great job by the committee in seeding it so well for 2015, as has been the case in other years, too. Fans should see some good games between now and May 16. And don’t forget, while the ECT is playing out, teams are also vying for a SEC championship, too. Based on the seedings, it could be. The teams met in mid April and Mount St. Dominic came away with a 1-0 win, in extra innings. MSD and West Essex last met in a county final in 2007, with the Knights winning. But don’t count Nutley out, either. Entering this week, the third-seeded Raiders had lost two games, both in extra innings. Nutley can swing the bats and its pitcher, Carly Anderson, loves playing in the big game setting. This is the 38th ECT, so let’s look back at some facts and figures over the past 37 tourneys. 2-Belleville appeared in nine county finals during the 1980s, winning three championships, including back-to-back titles in 1982 and ’83. Belleville made it to eight straight finals, a record which still holds, from 1982-89. The Buccaneers also won in 1989 and appeared in the 1998 and ’99 final. Belleville’s 12 appearances in the finals are tied with Mount St. Dominic for the most championship game appearances. 3-Livingston and Mount St. Dominic have each won five county titles, while Cedar Grove is third on the list with four crowns. 5-Before Livingston’s victory in 2013 over Mount St. Dominic for the second straight year, MSD was the last team to repeat as champions, winning in 2008 and ’09, both at the expense of Cedar Grove. The Lions also beat the Panthers in the 2011 and 2013 semifinals. 6-Caldwell is the only team to three-peat as champions. (1986-88), with all three wins in the final against Belleville. 8-Cedar Grove was the first team to repeat as champion, doing so in 1980. At that time, the Panthers were led by pitcher Laurel VanDer May, while its head coach was her brother, Ray, who returned to the helm of Cedar Grove in 2013. VanDer May coached the Panthers to a county final last year, and is no longer the team’s head coach. 9-Cedar Grove (1979-80), Belleville (1982-83), Caldwell (1990-91 and again 2004-05), West Essex (1997-98),Bloomfield (1999-2000), Montclair Kimberley Academy (2001-2002), Mount St. Dominic (2008-09) and Livingston (2012-2013) are the schools which have won back-to-back titles. If MSD wins it this year, they’ll be just the second team in the tourney’s history to repeat as champions on two different occasions. 10-Caldwell coach Mike Teshkoyan has the most championships with eight. Mount St. Dominic’s Lorenzo Sozio has won five, which is good for second overall. 11-Belleville-Caldwell (1986-88), Caldwell-Livingston (1990-91), Mount St. Dominic-Bloomfield (1995-96), Mount St. Dominic-Cedar Grove (2008-09) and Mount St. Dominic-Livingston (2012-2013) are the championship game matchups which occurred in consecutive years. Based on this year’s seeding, there won’t be a rematch of last year’s final. 16-Only three of the first 37 championship games have gone into extra innings, with Belleville (1989), Mount St. Dominic (2003) and Caldwell (2005) all winning by 1-0 decisions. The 2003 game between Mount St. Dominic and Bloomfield went 11 innings, the longest final on record. 20-MKA is the only team to beat Caldwell in a county final, doing so in 2002, 4-1, for its second straight title and last to date. Two years later, Caldwell turned the tables ad beat MKA, 3-2. 21-Livingston and Belleville had quite a rivalry in the 1980s. The schools met three times in a county final (1982, ’85 and ’89), with Belleville winning twice. In 1982, Livingston rallied from 4-0 down to stun Belleville, 6-4, in a state sectional semifinal. Five days later, the two met again for the county championship and Belleville won, 8-0, for its first ECT crown. A generation later, the two met in the 2001 county tournament, with Belleville prevailing by the mercy rule. A few weeks later, the teams met in the state sectionals, with Belleville winning a close 3-1 contest, en route to a sectional championship. The following year, Livingston went to Belleville in a sectional and won. Livingston’s current head coach, Jason Daily, was in his second year as head coach in ’02. 26-Sammi Rothenberger (Livingston), Kristen Mattia (Nutley) and Mount St. Dominic’s Olivia Gemma have hit three of the more memorable homers in Ivy Hill history, since the field became the venue for the finals in 2005. All three of those homers occurred in semifinal matchups. 27-Last year’s county final marked the first time the game ended with a five-inning mercy rule. MSD wins another championship. (Photo obtained from MSDA Twitter Page). The Mount captured a championship in the Red Pool and returned home with a 13-1 overall record. MSD will host its annual tournament this weekend, with some very good teams participating. (See https://mikelamberti.wordpress.com/2015/04/20/some-excellent-games-on-tap-at-msda-lions-softball-invitational-on-april-25/, for more information on Saturday’s event). Meanwhile, West Essex made a clear statement as the number 2 team in our most recent poll. The Knights lost a 1-0 game to MSD early last week, in extra innings, while defeating Bloomfield, Nutley and Livingston. Seeding for the 38th Essex County Tournament will be determined today, or tomorrow, and the top seeds, at least, appear pretty much set. Barring any weird kind of voting, Mount St. Dominic, the defending champion, will be the top seed, followed by West Essex. The winner of today’s Nutley and Cedar Grove game should be the third seed. If Cedar Grove loses today, the worst it should fall would be to the fourth seed, but if Nutley loses today, it might be the fifth seed, with Livingston possibly moving ahead of the Raiders to the fourth spot. Caldwell seems to be the sixth seed, and after that, it will get interesting. Verona has stepped up this year, and how about Columbia, with a 7-1 record, in the Liberty Division? Millburn is much improved, they’re 9-1 heading into this week, and got a big win over Belleville in a SEC Colonial Division game last Friday. Head-to-head matchups and quality of opponents often go hand-in-hand with the committee’s voting pattern, so that could affect Millburn’s status in the seeding. We’ll see. Some new studs in the FMTC lineup, as Livingston’s Marina Lombardi is the new Silver Charm while Erin Stacevicz of Cedar Grove is dubbed California Chrome. Lombardi is a senior catcher for the Lancers while Stacevicz, also a senior, runs like the wind and has a terrific bat at the top of the Panthers’ lineup. The Lions blanked three Ohio-based teams last weekend, by a combined 19-0, and, in most polls, remain the state’s top ranked team. Hard to argue. Knights are also the top seed in its state section, so far, and have been paced by the outstanding pitching of Sami Huetter (Canonero II). West Essex defeated Livingston last week for the first time since 2010. The Panthers only losses have been to Mount St. Dominic and West Essex. A big game today, opposite Nutley, should determine the third seed in the county tournament. A 2-game losing streak is very rare in Big Green land, but the Lancers did drop a pair of close ones last week, to Cedar Grove and West Essex. Raiders can easily vault to third in the poll with a win today at Cedar Grove. Nutley’s two losses have been in extra innings, to Livingston and West Essex. Raiders swept a pair at its tournament last weekend. Chiefs looked good in a 6-4 win over Newark Academy last Friday, as Cayla Lombardi pitched a complete game. Sentiment is building that the Hillbillies are becoming a very good team. Cougars enter the Top 10, making a statement with a nice win over Bloomfield last week. Columbia will take on Verona this Thursday. Bengals got back on the winning track with a pair of wins at the Nutley Invitational last Saturday. Millers are playing well, and appear to have its best team in five years. The annual Mount St. Dominic Academy Lions Softball Invitational on Saturday, April 25 will attract a very impressive field of teams. This year, there will also be a few more Essex County-based teams competing, including the host school, as well as Livingston, Newark Academy and Caldwell. The games start at 8:30 a.m., with the final set of matchups slated to begin between 4:30 and 4:45 p.m. There are two diamonds on the MSDA campus, with games being played on both venues simultaneously. If you haven’t been to this tournament, and you enjoy high school softball, you’ll really enjoy it. Not only are the games tremendous, but there’s a great snack stand area in the outfield, along with the chance to purchase some merchandise. Mount St. Dominic coach Lorenzo Sozio, who is also the school’s Athletic Director, has done a great job putting this tourney together over the years. Let’s hope for nice weather on Saturday. Here is the schedule and field assignments (#1 or #2). Red Lion (DE) vs. Pennsbury High School (PA), Field #1. Livingston vs AL Johnson, Field #2. Raritan vs. Newark Academy, Field #2. Raritan will certainly have a busy day. It is scheduled to host a tourney of its own earlier in the day, then take the approximately 40 mile drive to MSD for the late game there. That could have been said to West Essex coach Andrea Mondadori. after her team lost a 1-0, 8-inning thriller to the state’s top ranked team, Mount St. Dominic, on April 14, in North Caldwell. West Essex is not only talented, but they’re pretty young, with a sophomore-laden team. The only thing missing would be Mondo responding “the best”, which of course, she’s not going to do, because no one really knows yet how good this team is. If you saw them play the Mount, one thing is for sure. West Essex can catch the ball. The infield defense is tremendous. And no one is hiding in the outfield, either. The battery is solid, with sophomore pitcher Sami Huetter, (Canonero II) throwing very well, and senior catcher Rose Pezzuti looking great after a leg injury curtailed her 2014 season. There’s no hiding it anymore, Huetter is the real deal. She’s incredibly poised in the circle and the velocity on her pitches is outstanding. Pezzuti adds of level of calmness and stability behind the plate. She also has a very good throwing arm. 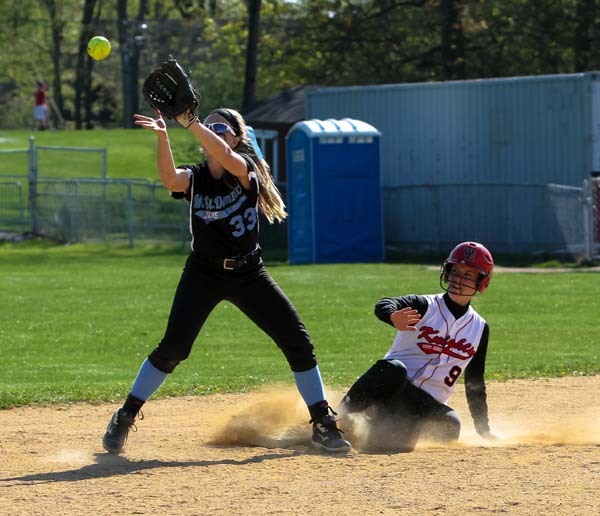 Rose Pezzuti, sliding into second in this 2012 photo, is now a senior and playing well for West Essex as the team’s starting catcher. Kate Jencarelli plays a wicked first base, Madison Gemma is settling in well at second base, Bridget Betley can flat out play, Amanda Garofalo runs with the best of them, Alexa Vardiman and Monica Onorata are key pieces to this team’s success, not to mention Amanda Schwartz. West Essex is in the midst of a crazy week. The Knights defeated Bloomfield on April 13 before playing the Mount on April 14. Key games with Nutley (April 15) and Livingston (April 16) will be followed by an out-of-conference game on Sunday, April 19, against powerful Northern Highlands at the EDSAF Tournament. The EDSAF tourney is certainly close to the Mondadori family. The tournament benefits Ari Solimando, a 2004 Emerson High graduate and former catcher for then head coach Steve Mondadori, who was paralyzed in an accident back in 2003. 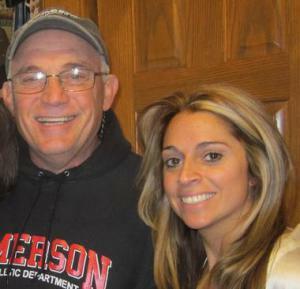 Steve Mondadori is Andrea’s dad and for many years, Steve’s team would play Andrea’s West Essex team in the tourney. Steve coached at Emerson, then for a few seasons at St. Mary (Ruth.) before retiring as a coach at the end of the 2013 season. Andrea Mondadori and her father, Steve. The tournament is held over two days and features a number of excellent softball programs in Northern New Jersey. Mount St. Dominic’s ranking as the state’s top team in New Jersey high school softball was certainly validated in the early going, especially last weekend, as the Lions went to the prestigious Rancocas Valley Elite 16 Tournament, and left with four victories and a championship trophy. Obviously, the Mount stays No. 1 in the FMTC Top 10 poll, but there are some good teams taking shape in the Super Essex Conference, which should make for an interesting race in the American Division, as well as some fun for the upcoming Essex County Tournament, that will probably be seeded in the next week, or so. Livingston, which vaulted to No. 2 after winning five straight games, has a new stud in senior catcher Marina Lombardi, or ‘Silver Charm’. The Lancers now have a stud battery, as sophomore pitcher Sydney McCormack, or ‘Syd The Kid’, was awarded her horseshoe a week ago. As far as Lombardi, she’s the last starter of those great 2012 and 2013 Livingston teams that dominated the SEC and ECT. Lombardi, a senior catcher, has marvelous range behind the plate and is not easy to run on. She’s also swinging the bat real well. (More on Lombardi in an upcoming blog). The new ‘Silver Charm’, Marina Lombardi, (left) warming up with the original Secretariat, in 2013. Lombardi is as good as they get behind the plate. After an opening day setback, the Lancers have shown steady improvement with a young team. They’ll have a huge assignment on April 15, when it plays a very good Cedar Grove team. Nutley had the chance to get out of the cold weather on April 8, as it headed to Orlando and the Disney Complex. There, Luann Zullo’s team won four straight games to improve to 7-1 on the season. The Raiders are back in action on April 15, hosting West Essex, in what could be a game that helps decide the second (and/or third) seed in the upcoming county tournament. Belleville continues to roll, with a 6-0 mark, as of April 14. And before everyone starts yapping about their schedule, the Bucs play whoever is on the slate. Belleville was moved to the Colonial Division after the 2014 season, which was a shame, because the Bucs had a young team that was just about ready to compete with the better teams in the SEC’s Liberty. Oh well, let’s see how the Bucs do when it comes to the county tournament. This is a good team, with improving talent, and a good coach in Chris Cantarella. Montclair has a new coach in Phil Delgado, who, if he could, would put on a uniform and play. The guy is intense as they come, yet encouraging, too, for a team that should find its way soon in the SEC’s American Division. Delgado will have the Mounties battling hard for the entire 2015 season. Have to get more into the SEC’s Liberty Division soon. Caldwell is the favorite to win there, but there will be some good battles in the Liberty, too. Newark Academy, West Orange, Columbia, Montclair Kimberley and Verona will be in the mix for a league crown, as well. Sarah Taffett had two hits and Kelsey Oh helped her own cause by walking and scoring the game’s only run in a 1-0 victory, at West Essex, in eight innings. Oh’s pitching has been tremendous in the early going. She’s unscored upon in SEC action. Head coach Jason Daily has a somewhat inexperienced team playing very aggressively in the early going. The pitching of Sami Passeri and Sydney McCormack give the Lancers a lot of options, as both have a different style, but get the job done. The Raiders were 4-0 last week in Florida. 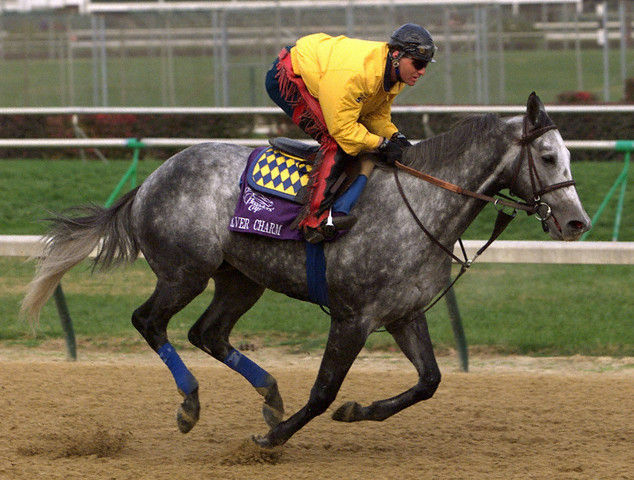 Spectacular Bid (Carly Anderson) continues to dominate. Canonero II (Sami Huetter) showed she’s among the best pitchers in Essex County after a great effort against Mount St. Dominic. West Essex’s infield defense is outstanding, especially first baseman Kate Jencarelli. Panthers just keep on winning. Erin Stacevicz is a STUD. (Just deciding on the correct name). Smarty Jones (Gianna Genello) is the catalyst at the top of the lineup for the Chiefs. A pair of one-run losses to Livingston and West Essex shows this team is more than capable of competing with the upper division. The Hillbillies will be in the run for a conference title, especially after playing a tough game against Caldwell. A big game with Millburn on April 17 will probably decide the SEC’s Colonial Division champ. Third baseman Sarah Guy leads a young team. The record might not reflect it, but the Mounties are battling. They’ve already played West Essex, Livingston and Mount St. Dominic. Southpaw Secretariat quickly establishing herself at IHA.